“The tragic attack on the Pittsburgh Tree of Life synagogue just two days ago serves as a stark reminder of the need to protect all Americans against hate crimes,” Rosenstein said Monday. That shooting occurred after a week during which the nation was gripped by a number of package bombs that were mailed to Democratic leaders around the country. The suspect in that case, Cesar Sayoc Jr., was ordered held without bail on Monday. Rosenstein’s comments on Monday were the first time he spoke publicly about the synagogue shooting. President Donald Trump nominated Rosenstein, who is Jewish, to serve as deputy attorney general in 2017. Rosenstein has been at odds with Trump during his time in office and reports have swirled that Rosenstein sarcastically suggested wearing a wire around Trump to capture unflattering moments within his administration. But both Rosenstein and Trump seem to be on better terms of late, after the two travelled aboard Air Force One earlier this month. Trump in recent days has caught some flak for his response to the bomb scare and the synagogue shooting, and has frequently blamed the news media for the political climate in the US that has seemingly prompted such acts of violence. Rosenstein praised Trump on Monday for condemning anti-semitism in the US. 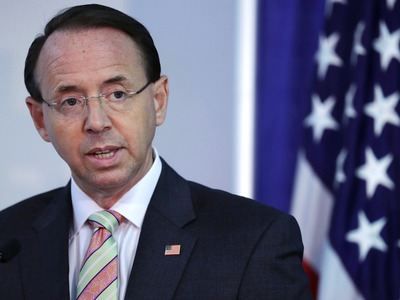 Rosenstein announced that the Justice Department created a new website containing information about how to report a hate crime, Politico reported Monday. Rosenstein said that there is a major discrepancy in the ways in which government agencies report hate crimes to the FBI, citing how 88% of the agencies that were tasked with reporting hate crimes to the FBI in 2016 reported zero hate crimes that year. The statistic suggests a lack of awareness about how to report them, Rosenstein said. All of this is happening as the November 6 midterm elections draw closer and both Democrats and Republicans clamor over control of Congress.